WallArt is a European Company supplying modern Dutch Design Eco Friendly Wall Panels. WallArt ; a global product available in Europe, Asia, United States and now also in India . WallArt 3d-wallpanels are 100% recycled, compostable and therefore 100% biodegradable . These panels are 500mm x 500mm each in size and designed to form a distinct pattern when put together. They are glued to the wall with the panels butted together. The joins between panels are then filled and sanded back. After installing them they can be painted in any colour to suit the interior of your home or office. WallArt introduced their 3d wall panels in Europe in 2010. They have been the first entering the markeT with this eco friendly home decor and interior product. At this moment there are 20 different models of the WallArt 3d wall panels available: Gaps, Bricks, Waves, Ellipses, Vaults, Sweeps, Cubes, Pitches, Squares, Splashes, CraterS, Kites, Pebbles, Sands, Flows , Tetris , Cullinans , Saiphs , Caryotas & Dundees . 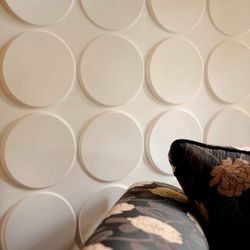 The WallArt 3d wall panels give an extra dimension to your walls and they will fit in almost every room of the house. The livingroom, the bedroom: WallArt 3d wall panels bring your walls to life! Minimum Order Quantity : 1 Box / 12 Panels per Box / 32.29 Sft . WallArt is a European Company supplying modern Dutch Design Eco Friendly Wall Panels. WallArt ; a global product available in Europe, Asia, United States and now also in India . WallArt 3d-wallpanels are 100% recycled, compostable and therefore 100% biodegradable . These panels are 500mm x 500mm each in size and designed to form a distinct pattern when put together. They are glued to the wall with the panels butted together. The joins between panels are then filled and sanded back. After installing them they can be painted in any colour to suit the interior of your home or office. WallArt introduced their 3d wall panels in Europe in 2010. They have been the first entering the markeT with this eco friendly home decor and interior product. At this moment there are 20 different models of the WallArt 3d wall panels available: Gaps, Bricks, Waves, Ellipses, Vaults, Sweeps, Cubes, Pitches, Squares, Splashes, CraterS, Kites, Pebbles, Sands, Flows , Tetris , Cullinans , Saiphs , Caryotas & Dundees . The WallArt 3d wall panels give an extra dimension to your walls and they will fit in almost every room of the house. The livingroom, the bedroom: WallArt 3d wall panels bring your walls to life! Minimum Order Quantity : 1 Box / 12 Panels per Box / 32.29 Sft .